First, I need to make sure you get umami… Umami is one of the 5 basic tastes – sweet, sour, bitter, salty, and umami. I think of it as rich and meaty, but not necessarily from animal protein. Mushrooms are loaded with umami flavor! Other fine examples include miso, kombu and bonito flakes (dashi), cured meats, ripe tomatoes, etc. Think of foods you love that have a rich, deep flavor… That’s umami! So, why mess up a good burger patty with a bunch of minced mushrooms? The reasons are twofold: 1. They enhance the umami flavors in the burger patties. 2. We eat a lot of beef here in the U.S., and it isn’t easy on the environment. Mixing mushrooms into burgers is a healthy and more environmentally-friendly option. The resources required to produce 1 pound of mushrooms is a fraction of that of beef. The mushrooms add the umami, earthy complexity to the burger, and keep the patty moist. The patty ends up about 25/75 mushroom to beef mixture. A small gesture, but with the tasty end result, it’s certainly worth a try. Now, let’s talk about that bacon jam! The recipe may look like a strange list of incompatible ingredients: Bacon and strong coffee? Trust me when I say IT. WORKS. It also keeps well, so put any leftovers in a glass jar, and save for another meal. Garnishing these lovely burgers is simple: I choose heirloom tomatoes and peppery arugula. You may prefer red leaf lettuce and green chile. The choice is up to you. My photos show homemade hamburger buns. Use your favorite rolls – homemade or not – just make sure they’re up to the quality of this beautiful burger. Don’t use a generic “hamburger bun” please! Make the bacon jam first. It’s best served at room temperature or warm, so if you’re using leftover jam, reheat it. Slice/prep your burger garnishes. Prepare the burger patties, and slice the hamburger rolls for the grill. Yes, you need to grill your rolls. The benefit of the maillard reaction that results is worth the extra step! Fire up the grill, and you’re just minutes away from an incredible burger experience… Just in time for the 4th of July! Mother Nature Network Are Mushrooms the Secret to a Better Burger? 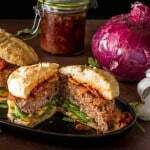 Umami Mushroom Burger with Bacon Jam certainly is! 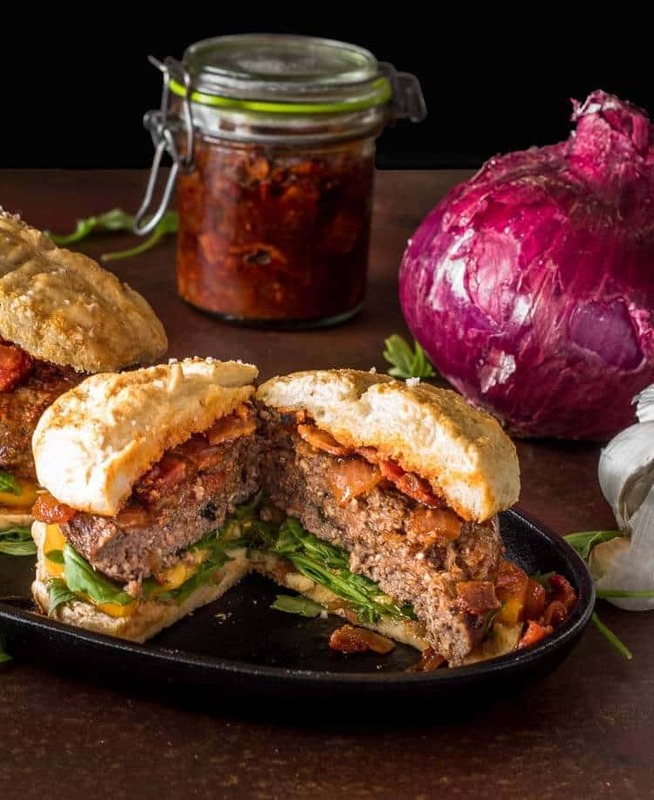 This lean umami-rich burger patty pairs perfectly with the slightly sweet, smoky, tangy flavor of the bacon jam. 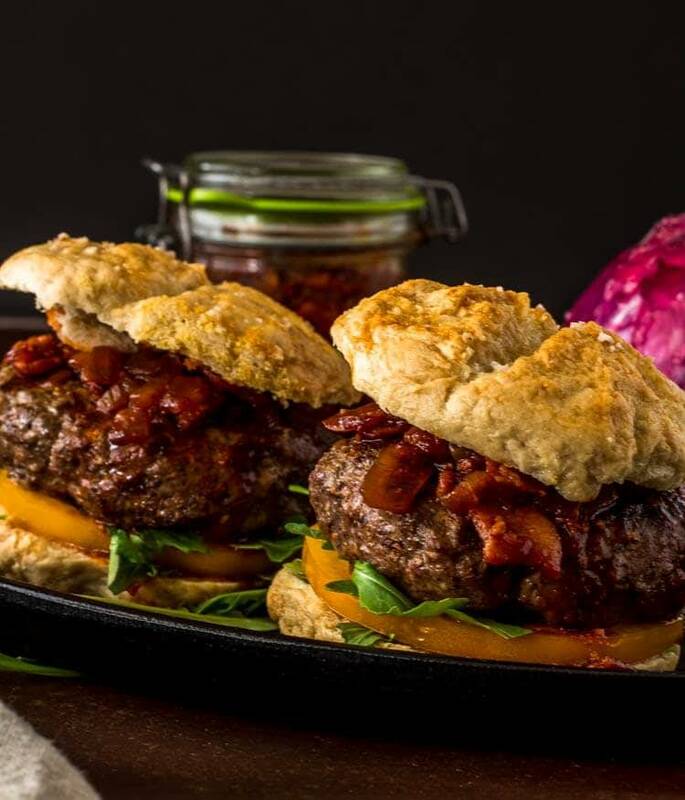 Make a big batch, and use the leftovers on another batch of burgers, on breakfast biscuits, or just eat it with a spoon! Fry bacon until crisp. Drain on paper towels. Remove all but a teaspoon of bacon fat. Cook the onion and garlic until soft but not browned. Add the sherry and coffee. Cook until reduced by about 1/3. Add remaining ingredients. Simmer about 10 minutes to allow flavors to combine. Add crumbled bacon back in, and set aside. Add mushrooms to the bowl of a processor. Pulse several times until finely minced. Scrape into a mixing bowl. Add beef (or other ground meat), furikake, salt and pepper. Combine well. Don't be afraid to use your hands! Form 4 to 6 patties. Grill. Brush the cut side of hamburger rolls with butter or olive oil. When you flip the burgers, add the rolls to the grill. Watch them carefully. You want grill marks, but don't burn them! Place one patty on a roll. Top with a handful of arugula, a slice of tomato, and a scoop of bacon jam. Substitute any good quality red chile powder, keeping in mind the heat level. I use a medium NM red chile powder, and we love a bit of heat. Adjust as per your preference. I save the mushroom "bits" (stems) for making Roasted Mushroom Stock. Store remaining bacon jam in the refrigerator for another batch of burgers or for toast or biscuits. It'll be fine for about a week. Ours never lasts that long! Furikake (Japanese rice seasoning) boosts the umami flavor of the meat, but is totally optional.